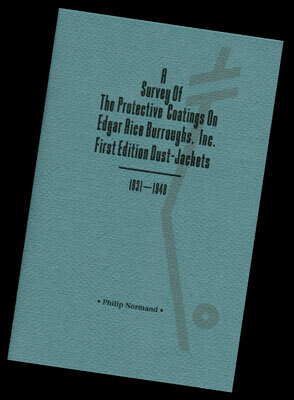 All the ERB, Inc. dust-jackets, with the exception of the first two, were given protective coatings. In some cases this was an overprint varnish put on by Kingsport Press where the books were printed. In other cases either a cellophane wrapping or a plastic lamination was adhered to the jackets. When varnish was used it would inevitably yellow to some extent and the white paper would be stained so that colored strips would appear on the jacket flaps, or, on some jackets the varnish would only extend to the front cover and spine. This varnish coating was added to the jackets as a protectant from scuffing during shipping and in storage. It was not a choice of the artist nor was the yellowing intended to be part of the design. It was an unintended consequence of using the printer's varnish available during those years. This yellowing was clearly noticable on many of the jackets which used a silhouette image (art against a white background) such as that on the first two Venus books and APACHE DEVIL. Because of various conditions of exposure to light, or due to slightly different chemical qualities, the yellowing varies from jacket to jacket going from a medium dark color to a very light tone. On the jackets with wraparound paintings the yellowing is only noticable on the folds of the jacket flaps. Because some collectors consider this aging varnish to be an integral part of the final dust-jacket I am offering the options of "Uncoated" and "Varnished" on selected jackets when it might be most noticable on the original. My intention with RECOVERINGS, however, is to produce reproductions of these jackets with the highest quality of detail and fidelity to the original art, not to replicate the artifacts of letterpress printing and production. WITH THE HELP of some well-noted Edgar Rice Burroughs scholars and collectors I have published a booklet containing the findings of a survey of the coatings for the entire series of ERB, Inc. dust-jackets. Every title from 1931 through 1948 is listed with a description of the type of coating found on the first-state dust-jackets. In addition, I have provided descriptions of the processes and products used for those coatings along with a clarification of the issues involved with identifying dust-jackets for the 1940 "Red-back Tarzana" reprints. The 20-page booklet measures 5.5 x 8.5 inches with an 80 lb. cover and is priced at $10.00.